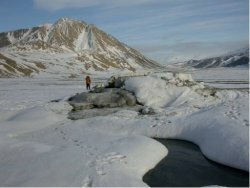 Researchers at McGill's department of natural resources, the National Research Council of Canada, the University of Toronto and the SETI Institute have discovered that methane-eating bacteria survive in a highly unique spring located on Axel Heiberg Island in Canada's extreme North. Dr. Lyle Whyte, McGill University microbiologist, explains that the Lost Hammer spring supports microbial life, that the spring is similar to possible past or present springs on Mars, and that therefore they too could support life. The subzero water is so salty that it doesn't freeze despite the cold, and it has no consumable oxygen in it. There are, however, big bubbles of methane that come to the surface, which had provoked the researchers' curiosity as to whether the gas was being produced geologically or biologically and whether anything could survive in this extreme hypersaline subzero environment. "We were surprised that we did not find methanogenic bacteria that produce methane at Lost Hammer," Whyte said, "but we did find other very unique anaerobic organisms - organisms that survive by essentially eating methane and probably breathing sulfate instead of oxygen." It has been very recently discovered that there is methane and frozen water on Mars. Photos taken by the Mars Orbiter show the formation of new gullies, but no one knows what is forming them. One answer is that there could be that there are springs like Lost Hammer on Mars. "The point of the research is that it doesn't matter where the methane is coming from," Whyte explained. "If you have a situation where you have very cold salty water, it could potentially support a microbial community, even in that extreme harsh environment." While Axel Heiberg is already an inhospitable place, the Lost Hammer spring is even more so. "There are places on Mars where the temperature reaches relatively warm -10 to 0 degrees and perhaps even above 0ºC," Whyte said, "and on Axel Heiberg it gets down to -50, easy. The Lost Hammer spring is the most extreme subzero and salty environment we've found. This site also provides a model of how a methane seep could form in a frozen world like Mars, providing a potential mechanism for the recently discovered Martian methane plumes."